For Heyes, the answer is cognitive gadgets and the tone is practical rather than abstract: the implications of her theory suggest different ways in which we might think more profitably about learning. What are these gadgets? 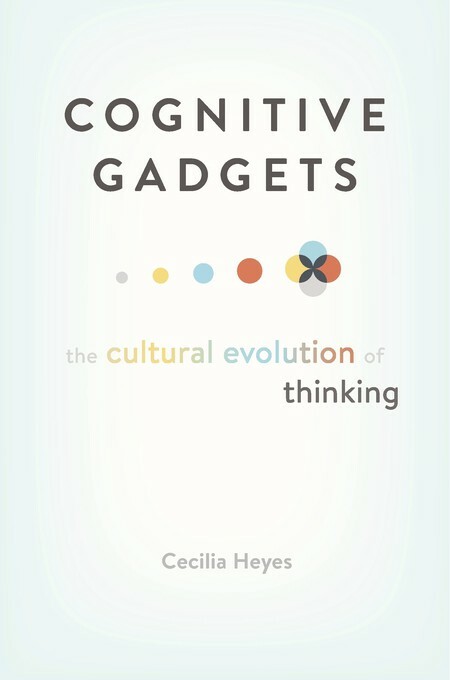 The cultural aspect of Heyes’ relatively short book (304 pages) for such a complex topic is important because the theory that the author espouses holds that “distinctly human cognitive mechanisms — ways of thinking — have been built by cultural evolution.“ She insists that they “are cognitive gadgets rather than cognitive instincts; pieces of mental technology that are not merely tuned but assembled in the course of childhood through social interaction.” Cultural evolution argues that individuals acquire their mental representations by observing the behavior of others. The theory “suggests that humans do not genetically inherit mechanisms that are specialized for the representation of mental states”, but rather culture interacts with ‘genetic starter kits’ to create such capabilities. What difference does this theory make? The difference between seeing ourselves as fixed entities mostly hardwired by genes and viewing ourselves as a collection of malleable elements that depend upon and are molded and remolded through social life. Models of development shift depending upon which of these theories informs a worldview and more critically the design, application, and evaluation of interventions as well the expectations of institutions. Heyes’ theory and the school of cultural evolution inspire great argument given the recent dominance of genetic explanations for the shaping of our central attributes. Heyes’ book offered a new and persuasive twist on that old debate for me. (Anyone who has recently seen the riveting and disturbing documentary Three Identical Strangers will be familiar again with the nature versus nurture argument.) While she outlines here difference with other schools, Heyes refuses to adopt an either-or stance and instead looks intriguingly at the ways in which genetic and cultural inheritances intertwine. As she writes, “It is far from easy to parse cognitive development” because “every aspect of human behavior and cognition depends upon a rich stew of factors.” She is simultaneously judicious and probing in her consideration of how much our abilities are fed by the culture part of the ‘stew’. The difference between cultural and genetic selection provides a vivid example of the implications of choosing or at least involving cultural evolution instead of relying only upon genetic theories of development. In the former view, the social mechanisms described “are inherited through social learning, but also because social group membership influences which cognitive mechanism and individual is likely to develop.” This recognition that the inheritance of cognitive mechanisms can take place “by group level or social processes — things that go on between people, rather than inside individuals’ heads — such as conversation, storytelling, turn-taking, collective reminiscing, teaching, demonstrating, and engaging in synchronous drills” shifts how we should look at not just teaching and learning but larger social phenomena. Collaborative learning becomes more important; social contexts grow in their significance. In dealing with the opportunity gaps that exist among different layers of American society, current interventions may prove inconsistent with this newer contemplation of the inheritance and transmission of cognitive mechanisms. My enthusiasm for the book does not suggest that it is an easy read. There are sentences to stop you in your tracks and make you retreat at least 20 paces; “supporters of the mind reading-first position suggest that, whether or not complex mind reading is required for Gricean communication, the evidence of implicit mentalizing in infants shows that humans are able to read minds long before they can have a conversation.” (Deep breath.) Some readers may find the book too technical as it moves through descriptions of gaze-cuing and rhesus monkey vocalisations, but the author merely is peeling back the layers of our understanding of the world or even more specifically of our learning. Much of what Heyes and her allies state still requires confirmatory and even extrapolatory research. Underlying principles to the theory need more of a foundation such as the tenet that “we like making things happen, whether the things are social or asocial. However, in everyday life, it is often social things that we are able to control, and therefore the reactions of other agents are a major source of response-contingent stimulation.” There is much to reconsider in this telling of human development. For example, halfway through the book and about to enter the passages devoted to four specific aspects of cultural evolutionary learning (selective social learning, imitation, mind-reading, and language), I found myself wanting to know how these mechanisms can produce disastrous beliefs such as anti-vaccination or conspiracy theories. The relevance to those of us interested in helping people to learn in organizations is clear. It is plausible that we have overemphasized individual over social and cultural learning despite knowing the latter’s importance. It is also possible that we fail to appreciate the enduring power of cognitive gadgets such as copy the prestigious or successful that suggest that principles enunciated by many change management theorists such as Edwin Nevis of the need to employ high-level players within the organization in order to get attention and compliance are simply an outgrowth of this function. If we apply the book’s insights to our own organizations, particularly Heyes’ points about cultural learning’s role in “enab(ling) each person and social group to benefit from the accumulated experience of innumerable other people, past and present, and thereby collectively to acquire knowledge and develop skills that far surpass those of other species”, do we find our current plans and methods wanting?